The Sons obviously don’t like to think of themselves as the bad guys. In their minds, a lot of what they do is because they “don’t have a choice,” as a SAMTAZ member so succinctly put it — they have to be violent and move guns and drugs because that’s the only way to keep the club and their families alive (often literally, considering what people like the cartel would do if they didn’t make good on their deal). But at some point, that rationalization isn’t going to be enough. Clay might think there’s a moral difference between muling and dealing, but Bobby sees that there’s really no difference at all. Once SAMCRO gets its hands on the 30 kilos of cocaine, their new business venture becomes very real, and the semantic technicalities of their involvement don’t much matter: They’re in the drug business with a big-time Mexican cartel. Period. “Una Venta” built nicely on what had been established over the first three episodes of the season, when all the new players and conflicts were being introduced, but not a lot was happening. This week didn’t explode in plot developments, but it moved most of the major stories along so it didn’t seem like anything was being stalled or avoided. The cartel partnership is a done deal, Piney continues his search for some leverage against Clay, Potter gets the intel he needs to rebuild a RICO case, and the Charming Heights development is still being opposed, now by a prominent citizen in the form of Roosevelt’s wife. 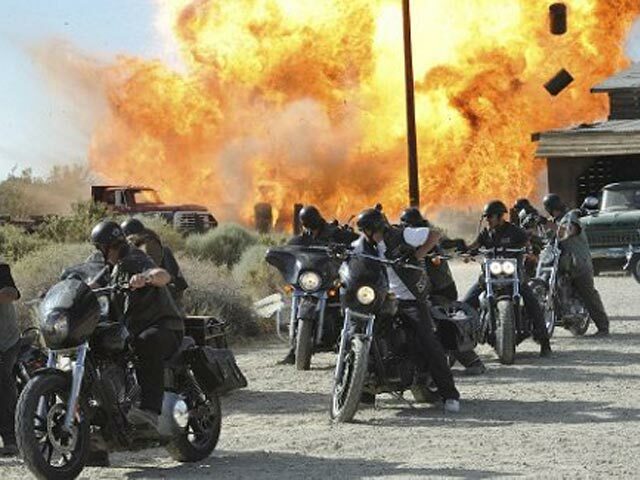 Where the show can stumble most frequently is in its standalone plots, but whereas last week’s involving the stolen guns was pretty silly, this one did a good job of tying back to the bigger themes of what SAMCRO is dealing with. SAMTAZ may have gotten into the drug business under false pretenses, but now that they’ve had a taste of the money it brings them, they vote to keep it going, even if the original vote was only due to betrayal and death within their own charter. They promise of new cash flow is what got Clay hooked on the idea of running coke in the first place — once the funds start coming in, might it be enough to change Bobby’s mind? It looks like things are going to get worse before they get better, but as long as the Sons have agency in their own turmoil (as opposed to the way they were acted upon by SAMBEL and the IRA in Belfast), I’m excited to be along for the bumpy ride. Where was Opie this week? On his honeymoon, or did he just stay behind with Kozik and Happy and whoever else didn’t make the trip? Clay’s arthritis is getting worse by the day. I figured his stepping down as President wouldn’t come for a while, but it would certainly be interesting to see how the show and the club function without Clay at the head of the table. I was curious about the revelation last week that Juice was half black, and why that would matter to the club. Kurt Sutter wrote a blog post about that, basically saying that “The fact is that most of the bigger MC’s do not have African American members.” I don’t know much at all about motorcycle club culture, so I guess I take him at his word on that, but I do think he misses the mark when he claims, “I can honestly say that none of the guys I know in the life are racist.” They certainly “function within a structure that is built upon a form of segregation,” as he says, but acceptance of such a segregated system is a tacit agreement with the status quo. Just because they may not be bigots does not mean they aren’t operating and benefitting from a racist structure, and I think there needs to be some more recognition of the inherently uneven power dynamics within a club built on that structure. In any case, I’m interested, if a little bit hesitant, to see how this storyline plays out. What did you think of this week’s SoA? Share your thoughts in the comments below! This entry was posted in Sons of Anarchy and tagged Charlie Hunnam, Jax Teller, Katey Sagal, Kurt Sutter, Ron Perlman, SAMCRO, Sons of Anarchy, Television, TV, Una Venta. Bookmark the permalink. I’m completely new to operating a blog but I do write in my journal every day. I’d like to start a blog so I can easily share my own experience and thoughts online.